For a start, e-Books are literatures that are not printed, but are stored and displayed electronically. This has indeed provided much convenience, not only in terms of portability, it makes it easier to transmit and send to receiving parties. For the points that have already mentioned earlier, I shall not repeat again in this short post that I will like to share in hopes that I can convince you that E-books are not as cheap as it is. If you have not read my earlier post on, Why Are E-books More Expensive Than Printed Books?, you can find it here. In general, e-books are subjected to licensing fees and all other related fees that are required to bring the electronic information available and legit for distribution to the consumers. Yet on the other hand, printed media such as paperback are only subjected to all the physical costs that are required for the publisher and the distributor. Judging by the number of possible charges, and not by the amount of each possible charges, to sell e-books will be very much subjected to many many possible fees, that are inevitable be borne by the consumer. As copyright fees are dictated by each relevant authorities (depending where), this sum of money is ‘priced’ and charged accordingly to its regulations. Unlike, the cost of printing and labour, it is pretty much standard and has been ongoing for many many years. As distribution and licensing costs for e-books are relatively new in this century, it may be possible that the fees may fluctuate and be changed accordingly to consumers’ demand. This hypothesis on the difference in licensing and other fees that are related to distributing eBooks on different titles is drawn from the example on different paperback titles with different prices according to its popularity. Comparing among paperback titles, it is not surprising to find that the recent and popular titles are prices somewhat higher if not, more expensive than the outdated titles that has been in the market for many years. If that is happening for paperbacks, it is without much doubts that it can also happen for e-Books too, where popular titles will be charged with heavier fees that are required for distributing legally. This is a relatively new book by James Patterson, a well known author with the series on Alex Cross by one of the distributors. Notice how the difference in pricing across all mediums in the screenshot? Digital List Price is the suggested retail price set by the publisher. As indicated, the original price of this electronic copy is $33.98, for convenience, let’s just say $34. And its counterpart, that is printed media is only $29. Almost a $5 difference! On a minor note, by spending additional $5, one will have to charge up the device before reading and it is quite obvious that electrical costs are not free. Unless you are living off the grid, on some form of electricity harnessed from Mother Nature. That being said, on a side note, is it really environmentally friendly to pay more to read e-Books? 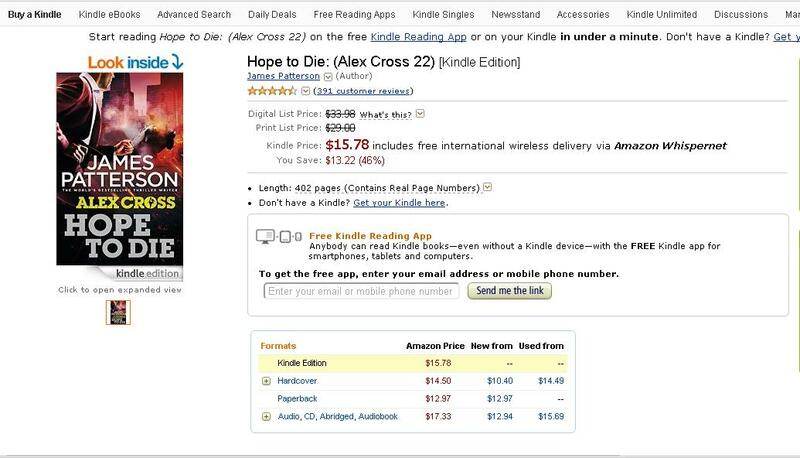 So with that discounted price, we compare e-book pricing with traditional printed paperbacks. Based on the assumption that all companies, regardless of their business models, are profit driven, it is without doubt that the company should be making lesser profits after given discounts on the Kindle edition. That being said, one can roughly estimate the break even price for e-books. Also, the profit margin should be much higher than printed paperbacks which attracts most distributors to massively push for e-books. Bringing the topic to a local context in Singapore, it is fortunate that cheap paperbacks are conveniently available, if you know where to find them. Partially due to the fact that most Singaporeans do not have a reading habit, most local book stores have ceased to operate in an environment of rising rental costs. Still it is possible to find cheap books in excellent reading conditions. For most Singaporeans, information is being ‘pushed’ to our IT devices and it is thought to be cumbersome to carry a printed book along. Henceforth we Singaporeans believe that it is more convenient to ‘load’ the electronic material or more titles into our devices such as Kindle, smartphones or tablets and read it on the go. That being said, it feels good to know that one device can carry 20 books compared to carrying a physical book itself. But the actual problem to this is, it is not like anyone can finish 20 books of 300 pages on a train ride home. In other countries, there are Meet-the-authors sessions and such to get physical books autographed. Or is it that it is necessary to organise such events to bring forth a reading habit and eventually start a reading trend here in Singapore? Well for a start, the local government has started free public libraries many years ago, in hope that Singaporeans can have access to reading materials regardless of living conditions. While that being said, each age group will give you an unique reason why they are not reading. This will be my next posting. Still there is a number of Singaporeans who reads and they are regular clients of BooksAvenue. That is also why BooksAvenue is created on-line, without a physical store to serve this purpose. While we promise that we keep the prices competitively, we also ensure that the books are in readable conditions, such as no torn, missing or dogged ear-ed pages. All in all, we strive to deliver the best reading experience. And if we ever do eBooks one day, we will ensure that the prices are low and affordable too. And now what we can do is to partner with SecondhandeBooks. From the site SecondhandeBooks, there are second hand ebooks which are previously owned by other owners. These ebooks are being shared for free. If you like the site, feel free to buy the owner a cup of fresh brewed coffee via the product page. Or you can simply click here to do so. Afterall, don’t forget the tagline, BooksAvenue: Our Books, Your Convenience.